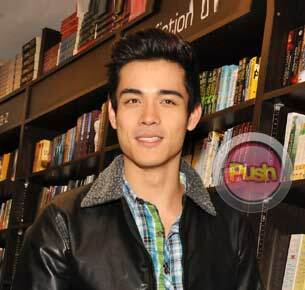 Xian Lim says he just wants his 'My Binondo Star' co-star Kim Chiu to be happy. Currently playing the role of Andy Wu on the hit primetime series My Binondo Girl, Xian Lim admitted he is enjoying his steadily growing popularity. “It’s a karangalan. Masarap na finally mare-recognize ng tao yung kakayahan mo, yung capacity mo and I know I can show more. Sa taping exciting kasi every time they give us scripts, I want to see kung ano pang mga twists and turns na mapapakita sa story and yun I’m just really happy na natatanggap ng tao,” he shared during the Star Magic Catalogue autograph signing at Fully Booked, Bonifacio High Street last October 9. The 22-year-old model-actor also hosted the after party program, along with Megan Young at Cav Wine Bar that same day. “It’s my first time attending the Star Magic Catalogue launch and I’m hosting so that’s an experience. I’ve been hosting with Megan before in different shows. It’s fun and ang tagal ko ng sinasabi sa kanila na I want to be a host. It’s something that I would want to do,” he added. After more than a month of working together, Xian admitted that his admiration and respect for lead star Kim Chiu has only grown since their first day on set. “Nothing has changed. Ngayon I’ve been seeing her halos everyday for the past how many months and parang ‘pag nakikita ko siya, parang siya pa rin yun. She’s real. She’s a real person. May mga taong fake, hindi pinapakita yung tunay na sila, may front lang, but si Kim, she’s nothing like that. Maski 4 am or 5 am na, masaya yan. 8 am na pero nandun pa rin yung smile niya,” he admitted. Recently, the Fil-Chinese hunk surprised Kim with a life-size teddy bear on the set. “Kasi she wanted a really big life-sized teddy bear. She was talking to someone else and I just overheard. So I looked for the teddy bear and I bought it for her. She said thank you and she was happy. And I’m happy na she’s happy. I guess she’s happy. She was smiling when I gave it,” he recalled. Despite the gesture, Xian denied that he is courting his co-star already. “No, no, no. I just overheard kasi. Siyempre naman gusto ko masaya kaming lahat and seeing her happy makes me happy too,” he admitted. When asked how the people how rest of the My Binondo Girl cast and crew reacted to the surprise, Xian downplayed the incident. “They were amazed because it was so big. That’s it (laughs). I’m just showing how great a friend she is. Ganun lang,” he stressed. When asked if he would eventually take things to the next level by asking her out on a date, Xian said he prefers to just keep everything on a professional level for now. “I just want to focus on work, you know. I’m pretty sure she also wants to focus on work din. I’m pretty sure,” he added. But the My Binondo Girl actor couldn’t deny the fact that there seems to be a lot of on-screen chemistry between him and the pretty chinita. “Kasi naman ako, ‘pag natatabi ako kay Kim, talagang ako rin kinikilig ako eh (laughs). That’s probably why ang nakukuha nilang impression. I’m just really amazed by her personality tapos maybe ‘pag nakunan na ng camera, maybe dun nagre-reflect so yung mga ngiti,” he explained. Aside from Kim, Xian said that he has gotten close to almost all his co-actors on set, especially Matteo Guidicelli who plays his younger brother Trevor and Jolo Revilla who plays Onyx, Kim’s childhood best friend. “I guess our relationship really grew. All four of us dito sa set. i guess we’re all comfortable with each other. I think our friendship grew from seeing each other constantly. Talagang I can definitely say we’re all friends. Solid friends,” he said.